Another good race meeting at Laguna Seeca and the full metal downforce of the track provided some excellent entertainment and some excellent lap times. As always, most people were unprepared and some models where never going to make the end of racing, but others made lucky decisions and for those who could stay out of trouble, there was a place on the podium for them. First class up was Hot hatches, in the past this has been open to loose translation and tonight was no exception. Most models were in the spirit of the event and that’s all that really mattered. Tim drove a nice Carrera Sirocco and Bob as usual drove a selection of very nice cars. It was going to be a Ninco v. SCX event and with SCX outnumbering the rest it was a good drive that saw Gary bring his Ninco tuner home in front of an SCX pack. Chris and myself drove well but not well enough to claw back the margin. 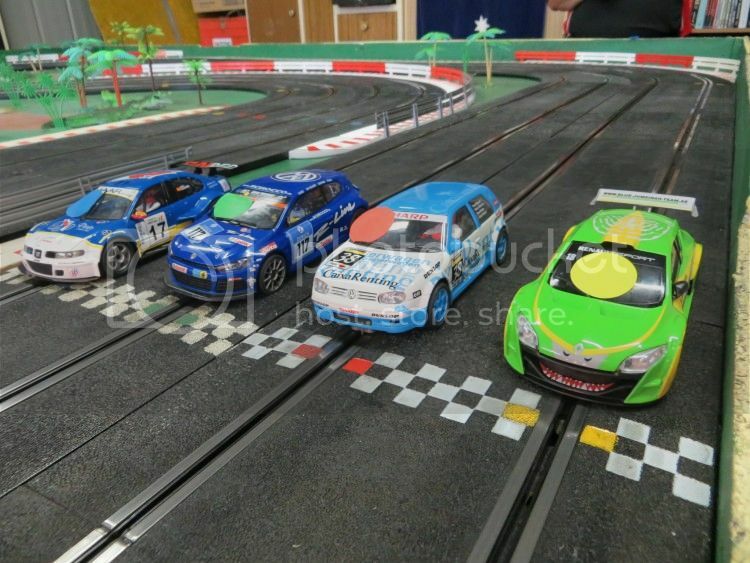 Next up was WRX rally and once again some nice models on the track. In practice my Peugeot 206 was lapping half a x\second quicker than anyone, but the first heat of the event saw it do a vertical leap on a back corner and further inspection revealed traction magnet had been forced up into the body of the model, ?? Victim of one of Ninco track joints. But I did manage to clock the fastest lap before it happened. This time it was Chris’s turn to fend off challengers. Ken was a perpetual presence at the front the field and it was all most could do to stay out of his way! 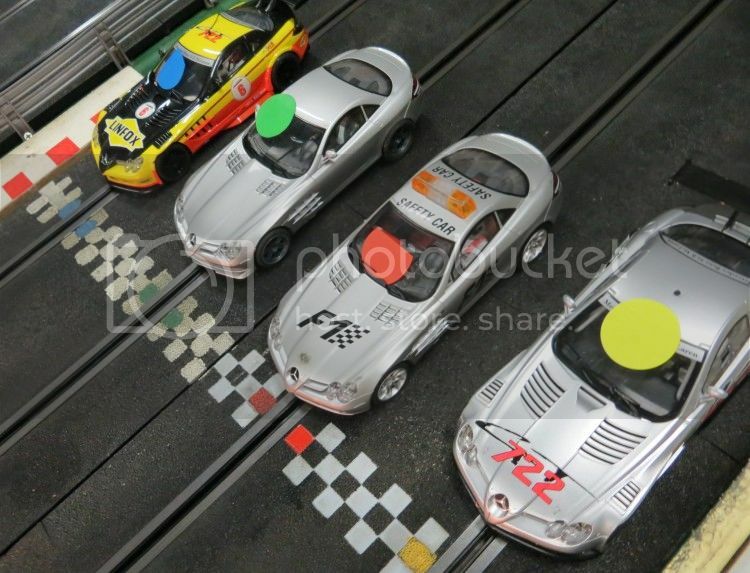 Last up was the new trophy class, Mercedes (of most shapes and sizes) The new GT Mercs were very popular but a few of us relied on some old tried and test CLK’s and it was obvious from the first heat that a little blue SCX CLK was definitely the tool to use. Final results saw me home in first spot with Chris and Barry spread out some little way behind. A good afternoon’s racing and I don’t think many escaped incident in one form or another, Barry spent a little time in all events leaping the fences and on to the floor with a sickening crunch. Some spent precious time staying out of Kenny’s way and Fritz proved that even though the track is about ten years old Bob had obviously left out a stretch of fencing on the infield. He found this gap time and time again and there were one or two decidedly dicey moments when he drove across the path of models coming down the main straight! Not sure what the Mercedes class has in store over the coming rounds but I’m sure there will be some more loose translation taking to the grid.